1. What are payday loans? Payday loans are small dollar short-term cash advances that are used to deal with emergency expenses. Also called as payday advances, these are usually due along with interest on your next payday. Understand that these cash loans are meant to get over short-term cash crunch only and should not be used for long term. Payday cash advance loans can be obtained at store front or online. 2. Are payday loans online better than loans from storefront? Getting an online payday loan has many benefits than getting a loan from storefront because a cash advance from payday loans online lender offers fast loan process, instant approval, and direct deposit of cash in hours or overnight without even standing in lines, waiting for approval, writing checks and faxing documents. 3. For what purpose can I use an emergency payday loan? Taking out a cash advance online can help you pay for emergency expenses such as medical bills, car repairs, home renovations and for recurrent expenses such as rent, mortgage, utility bills, groceries, etc. 4. How to get 1 hour payday loan? Applying for one hour online payday loan is easy and simple. Fill out online application, get instant loan approval and receive fast 1 hour cash upto $1000 directly into your account or maximum by next day. Besides, quick payday loans can be applied through mobile device, laptop, tablet, or PC. 5. What are the requirements for easy payday loans? Employed for the past three months. Active checking account for the past three months. Earning a monthly income of at least $1,000. 6. Do I need to fax any documents to get an online loan? No. There is no paperwork involved because we utilize proprietary underwriting to approve your loan. Hence, our loan products are called as no fax payday loans or faxless cash advances. 7. How do you determine legit payday loan amount? The cash loan online amount is determined based on your current monthly income. Although we offer advance payday upto $1000, you can qualify for $500, as a first time borrower. 8. How can I become eligible for a $1000 loan online? Once you repay your first payday loan successfully and exhibit trustworthy financial behavior, we will reward you by increasing your loan limit by $100 on each successful repayment. However, we do not supply loans exceeding $1,000. 9. How soon can I get the loan decision? We offer instant approval payday loans online. Once we receive you request, we will contact you either through email or by phone within minutes during normal business hours, Monday to Friday, 8:00AM to 8:00 PM (EST). For no fax loans requested after-hours, we will contact you the first thing, next business day. However, due to state and verification requirements, not all online payday loan applicants may be eligible for fast approval by lender. 10. I have a bad credit. Do you perform credit checks? As a bad credit payday loans guaranteed approval direct lender, EZPaydayCash never runs any hard credit checks. Our no credit check payday loans online can be qualified with poor credit and no credit even. 11. What is meant by APR? APR stands for Annual Percentage Rate that describes the annual interest rate on the loan. For more details, refer our Fees page. 12. How much will cash advance loans cost? Our fee for a payday loan is $30 for every $100 borrowed, with an APR generally ranging from 365.00% to 1564.28%. As a legitimate payday loans lender, we carefully abide by national and state regulations in determining our loan fee. 13. Are there any restrictions on the way I use my payday loan? No. You can use the quick cash loan amount the way you want but in a responsible way. 14. Can I request a payday advance over weekends? Yes. However, you will not receive it fast because any direct lender payday loans requested on Fridays, before 8:00 p.m. (EST), will be deposited on the following Monday. For any application received over the weekend, the funds will be deposited on the next business day that is, on Monday. 15. Can I cancel my requested online payday loan? Yes. If you accidentally apply for a loan that you did not intend, simply give it back to us before the end of the business day, following the day you received the loan. For example, if you receive your loan on Wednesday, you have time until 5:00 p.m. on Thursday to return it, without any penalty. 16. How do I repay my no credit check loan online? Payday loans are single payment loans that can be repaid electronically when you get your next paycheck. Just as with receiving the funds, the payment process is automatic and convenient. An electronic withdrawal, via ACH transaction, will be made from your authorized account on your payment due date. In case, there is any change in your banking information, please email your new bank account number to support@ezpaydaycash.com at least 2 business days before 1 PM Pacific Time on the due date in order for the change to be processed for the current payment. This way, you need not have to write a check or pay for postage. 17. When should I repay my poor credit payday loan? Generally, you should repay your cash advance loan on/by your next pay date. Our payment system is set up in the same way as any online bill pay system; with the automatic withdrawal date via an ACH transaction falling on the same date your paycheck reaches your checking account. This way, you can ensure to have the funds necessary for the repayment. 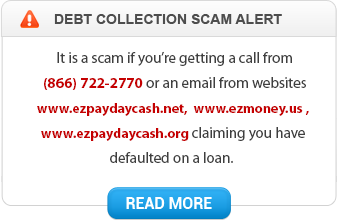 If you aren't sure about your loan due date or the amount you owe, please send an email to our Customer Service Team at support@ezpaydaycash.com. They are available to help you 24 hours a day, seven days a week. 18. What is an Automatic Clearing House (ACH) transaction? ACH stands for Automatic Clearing House Transaction. An ACH transaction is a method of electronically depositing or withdrawing funds from an account. When you provide a check as payment on your loan application, you authorize us to process the payment as a check transaction. 19. What if you withdraw more than the authorized payment from the account? EZPaydayCash is a legitimate cash advance direct lender that follows all NACHA regulations. We always abide by the state and federal laws, and will never withdraw more money than you have authorized in our process. 20. What if I fail to repay the loan on the agreed due date? Contact us at least two business days before the due date. Thus, you may avail an extension by paying at least enough to cover interest earned up to that point (usually includes the finance charge that is $30 per $100 borrowed and APR (Annual Percentage Rate) that ranges from 365% to 1,564%, depending on the terms of the extension). We also recommend that you pay as much extra as you can, to reduce the principal balance of your payday advance. 21. How much is the non-sufficient funds (NSF) fee? 22. Can I pay back my no credit check loan ahead of its due date? 23. Can I request an extension or partial payment? Yes. If you do not want us to withdraw the full amount on the faxless payday loan due date, you have the option to extend your loan until your next payday. You may make partial payments at any time prior to maturity in increments of at least $5 on the principal balance without additional charges incurred. 24. Is my personal information safe with you? Yes. As a socially responsible advance loan direct lender only no third party, we respect your privacy and hence do not sell your sensitive information to third parties. All the transactions are processed over a secure SSL server that uses highest encryption standards. 25. I am from the military. Can I get an online loan from you? We appreciate your service to the country and thank you for considering us. However, we do not provide cash loans to the military personnel currently. 26. Are online payday loans expensive? No, if you borrow only the amount you need and payback responsibly.